So I’m wondering if it’s bright enough? Seriously, I’m thinking I need to show my work. 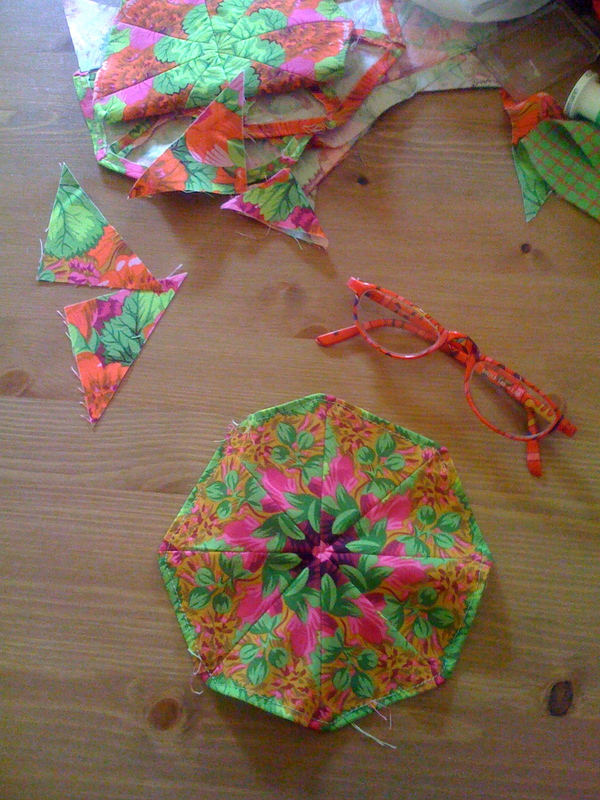 I took a class at Cool Cottons, using the technique in the One Block Wonder book. 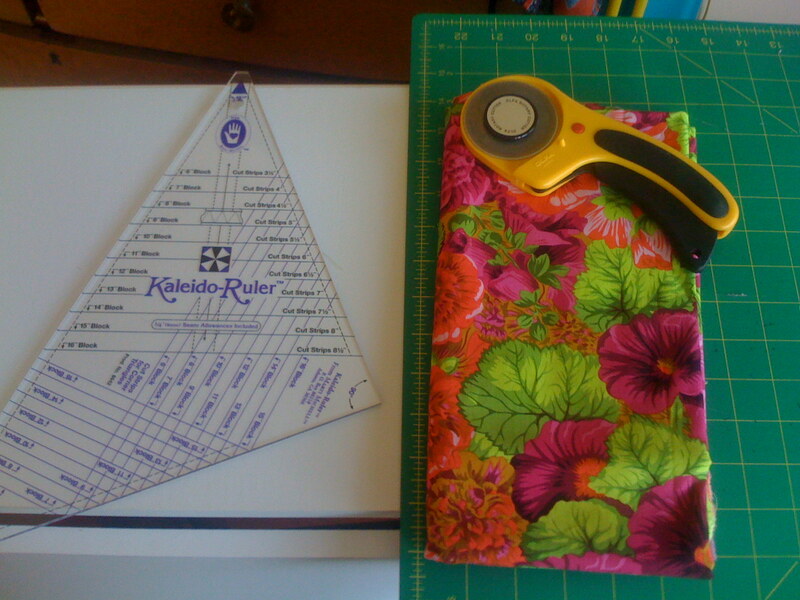 You use the special Kaleido-Ruler to cut triangles of a certain size out of fabric strips of a certain size. Then you join smaller triangles to the octagons to form a square. You can choose triangles that contrast with the nearby octagons, or triangles that blend with the adjacent octagons. 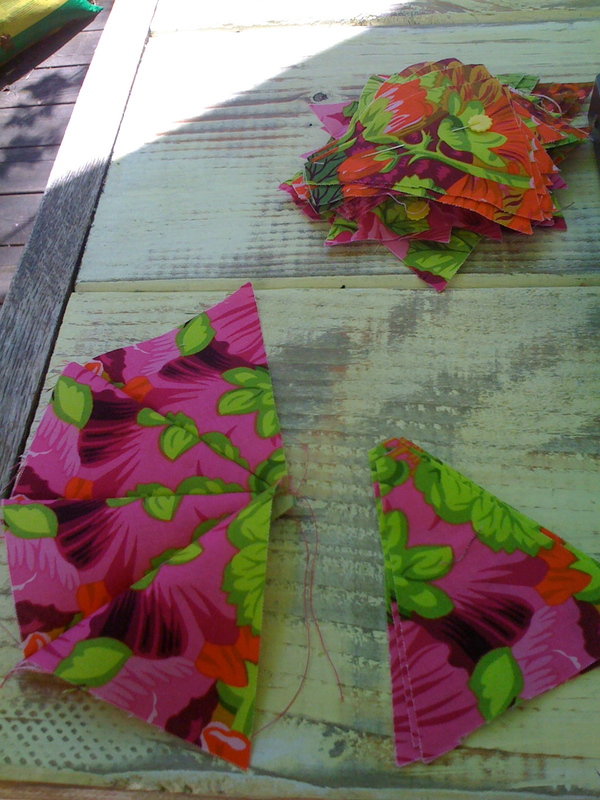 I chose ones that blend, which gives a different effect than when you choose contrasting fabric. 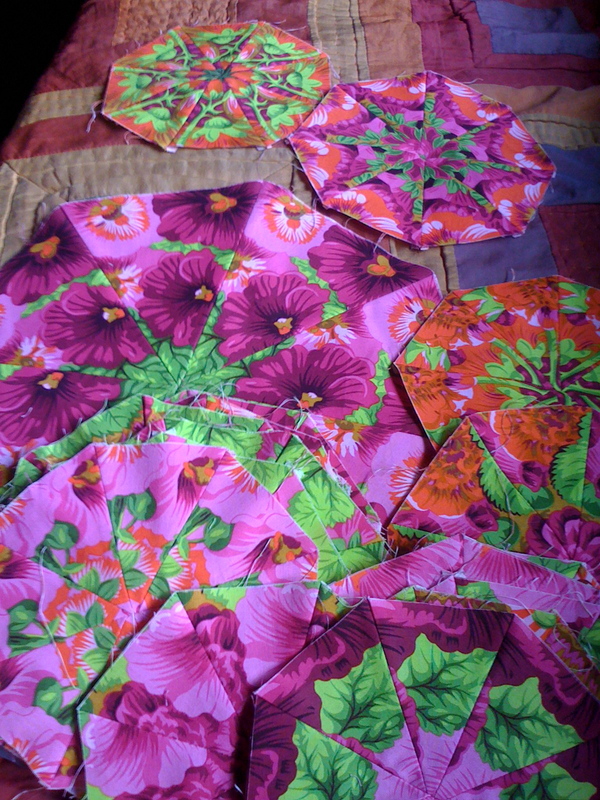 That’s why my quilt looks somewhat different than many one block wonder quilts, I think. 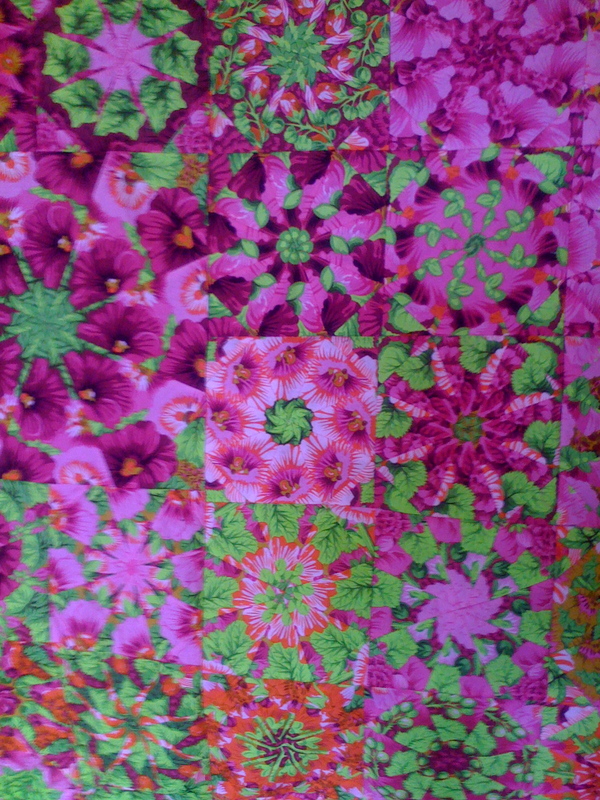 Then you join the squares so they look like what you see when you look through a kaleidoscope. Now I need to quilt it and and binding around the outer edge to finish it off. Then it will join its fabric kinfolk in Toaster Moon. Wow, Marie, that is amazing. I took a crack at sewing Aidan a cape last Halloween and it took an entire day… Congratulations! That rocks …..so out loud! How did you do those way cool borders? Thank you everybody!! 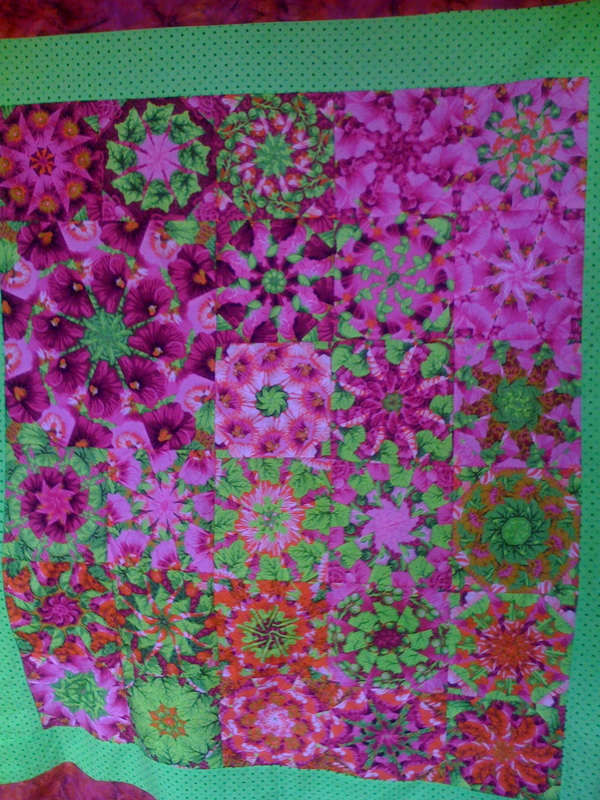 Beth, when I finished (I thought) the top, I realized the outer border was just too blah (even though it was a bright color). So I just cut some random curly lengths from the inner border fabric, and some random geometic shapes from the fabric the one block wonder squares were made from. Then I just laid out randomly. No real plan, just an instinct kind of thing. I thought it was much more balanced when I finished! Absolutely gorgeous! Love the colors and your craftsmanship is impressive. I really like the border. Another nice touch is the one large square that you put in the pattern. Thank you so much! Yes, doing a large block was the teacher’s suggestion. Since my quilt is small, I only put one. 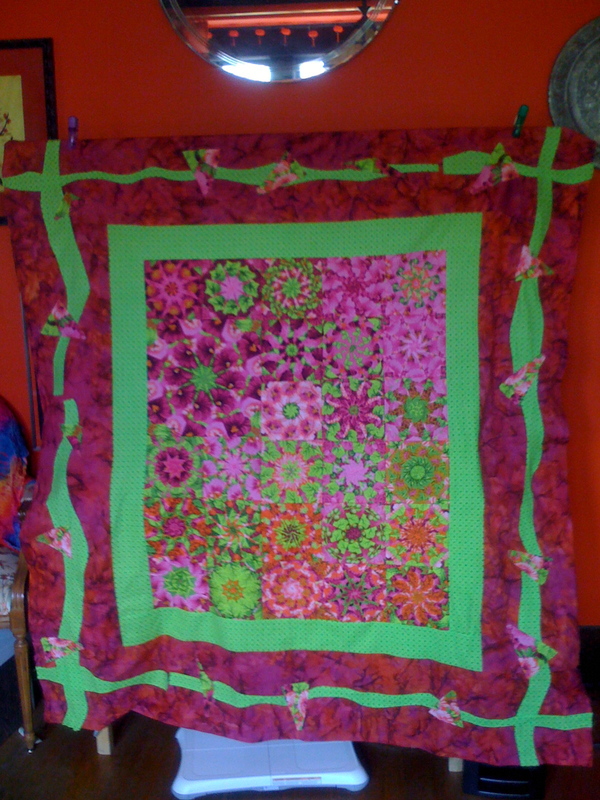 In larger quilts she suggests three. Should always be an odd number. There is something soothing with symmetry, but I am still drawn to asymmetrical (odd numbered) patterns. Beautiful quilt! I work for C&T, the publisher of the book “One-Block Wonders” – I’m so glad you enjoyed the process! I just joined Crafty Nation and saw you there. 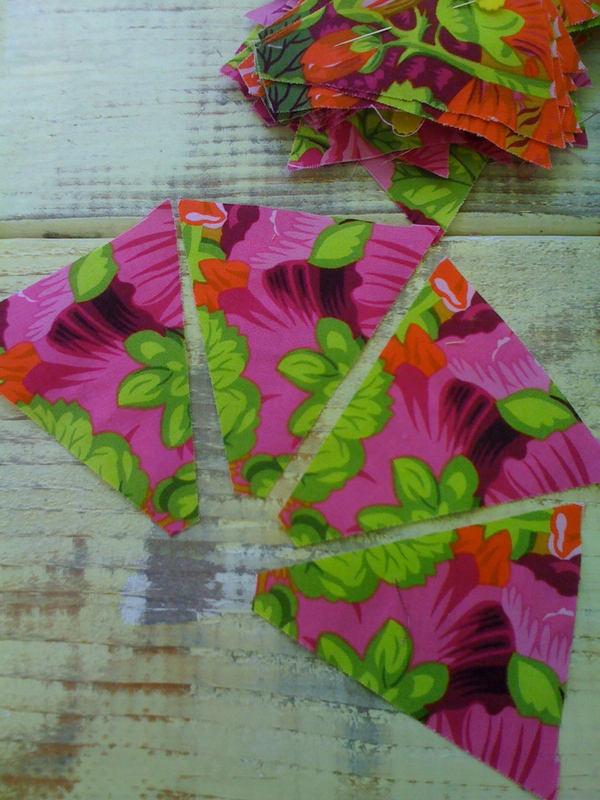 I’ve been trying to figure out how to cut the triangles for the one block wonder, and I have that triangle ruler you showed in the first photo, but it doesn’t match the triangles in the next photos. Am I missing something?